In Dubna started an advanced pulsed reactor IBR-2, which has no analogues in the world, the adviser to the Directorate of the Laboratory of Neutron Physics Joint Institute for Nuclear Research (JINR) Vladimir Ananev. "IBR-2 — is setting a record for the intensity of the neutron flux per pulse and technical solutions that make it possible to get it. It is included in the European program for the development of neutron diffraction and is the only high-flux pulsed specialized research neutron source, not only in Russia but also in all the countries — members of JINR ", — Said Ananev. With an average capacity of two megawatts thermal reactor power generates about 1.5 megawatts. 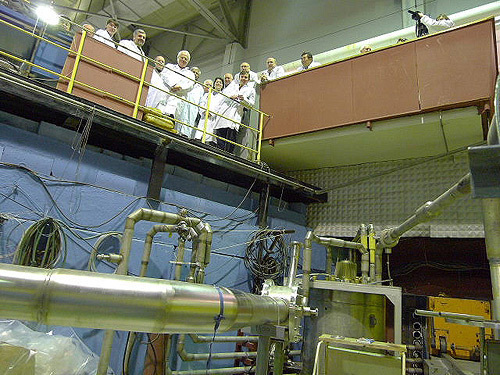 The reactor will allow more than 200 experiments per year in the field of physics and chemistry, materials science and earth sciences, life sciences, and engineering sciences with the participation of scientists from more than 30 countries. Ananev noted that while the power of the reactor is 3% of the possible, with the peak — 2 MW — it will reach the end of October. He stressed that the current energopusk, which will last about four months, would "test the limits of exploitation in the future." The scientist said that soon it would "actually resume the broad research program." In particular, it is about the study of the properties of materials under extreme conditions, the processes occurring in the Earth’s crust (including the occurrence of earthquakes), new nanomaterials. Ananev also said that the IBR-2 is included in the European program of neutron diffraction and is currently the only high-flux pulsed neutron source, not only in Russia but also in all the countries participating in the studies conducted by JINR.